You might not think the two go together, but the earthy, energetic, loud and lusty sounds of the Raghu Dixit Project make for a perfect harmony between folk and rock, between contemporary and traditional, between the overproduced sounds emanating from a recording studio and the simple but powerful tunes of a street musician. The lungi-wearing, junk jewellery-sporting singer wows listeners with a pan-Indian sound that is difficult to classify and easy to listen to. What is clear is the gusto and the enthusiasm of the musicians collaborating with Raghu on his debut album as they use acoustic instruments to give a vibrant feel to the foot-tapping numbers. Once an accomplished Bharatnatyam dancer, Raghu was often jeered by his classmates at college for having a rather ‘feminine’ accomplishment to his credit. 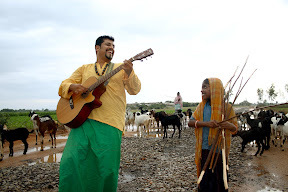 “It triggered a need in me to learn a rock song and perform it,” laughs Raghu. He did it and was hooked to the joys of letting his emotions out through song. When he moved to Bangalore in search of a job, he left dance behind and started a band called Antaragni. When that disbanded a few years later he decided to go solo, collaborating with different musicians at different times, keeping his sound fresh and dynamic. It has been a 10 year long journey to his first album. After college, Raghu started off as a technical writer for a pharma company. He quit it to pursue a musical career but soon found himself without any visible means of support. He rejoined a software company and rode out a stock option vesting period to give himself the capital to try the music business again. He invested in a music studio and started recording ad jingles. Once that started generating some revenue, he quit his job and concentrated on music full time. He caught a break when one of his friends put him in touch with Vishal/Shekhar, the composing duo that has been responsible for many hip Bollywood hits like “Right here, right now” from Bluffmaster and “Dard-e-disco” from Om Shanti Om. “I thought I could get a job as a playback singer for them so I went to Bombay to audition,” reminisces Raghu, “and sang one of my own songs.” Bowled over by the new sound, Vishal and Shekhar decided to promote and distribute the struggling singer’s home-made album. “They sent it around to their friends in the movie industry and amazingly, some of them actually listened to it,” says Raghu humbly. Stars like Priyanka Chopra and Sunjay Dutt were so impressed they decided to endorse the album. Music videos were shot for some of the songs from the album and got favorable plays on MTV. The Raghu Dixit project had arrived. The singer remains grounded and self-effacing despite his growing popularity. I asked him if he had any advice for aspiring musicians, having gone through a long period of struggle before getting recognized. Check out samples from the new album here. The songs are wonderfully melodious, full of life and because they come from the untrained and simple soul of the singer, are eminently singable. Unfortunately, the album itself is available only in select stores in Mumbai and Bangalore. “Distribution is our main challenge and Itunes does not allow music from labels exclusively based in India,” says Raghu. The album is worth picking up on your next trip to India, though. It is also available online at musicyogi.com. This entry was posted in Entertainment, Personality and tagged Folk rock, indipop, Raghu Dixit, raghu dixit project, vishal shekhar on March 18, 2008 by vpdot. Thanks for the lovely review. With your permission, I would love to link to this review on the band blog. Also, International distribution is now in place. You can buy the album off CD Baby in a few days if you are in the US and a distribution channel is in the works with people in Europe. We are working also to get to all parts of the world and digital distribution is currently the answer for the rest of the world. We will put up details on the band blog as soon as each of these is in place! Had never heard of this guy…phenomenal!!! If this guy is promoted well and people gets access to his music, his sound will be the next sonic revolution in India 🙂 This guy makes me miss my country even more! Damn!